CUG Recruitment 2019 - Job notification for Guest Faculty Posts in CUG, Gujarat. Applications are invited by Central University of Gujarat, Gandhinagar on or before 09 May 2019 for 8 vacancies. CUG Recruitment 2019 - Job notification for RA, SRF & PA Posts on a project entitled "Developing the research methodology for enhanced KCI recovery from sea water" in Department of Science and Technology, CUG, Gandhinagar, Gujarat. 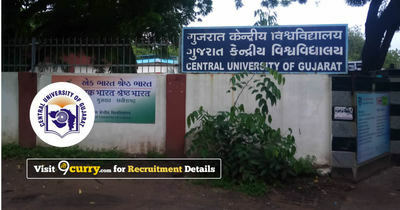 Applications are invited by Central University of Gujarat, Gandhinagar on or before 30 Apr 2019 for 3 vacancies. CUG Recruitment 2019 - Job notification for Project Assistant Post on a project entitled “Synthesis of natural product congeners to reinvigorate te investigation of their chemistry & activity against inflammatory parthenogenesis” in CUG, Gandhinagar, Gujarat on Temporary Basis. Applications are invited by Central University of Gujarat, Gandhinagar on or before 24 Apr 2019 for 1 vacancy. CUG Recruitment 2019 - Job notification for JRF Post on a project entitled "Synthetic Oligomers as Inhibitors of Protein-DNA Interactions: Towards Novel Cancer Therapeutics" in CUG, Gujarat on Temporary Basis. Applications are invited by Central University of Gujarat, Gandhinagar on or before 19 Apr 2019 for 1 vacancy. Sector-29, Gandhinagar - 382030, Gujarat, India.